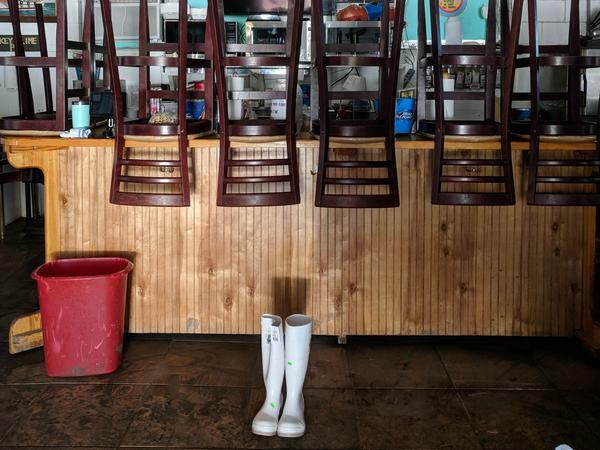 At Lynn's Quality Oysters in Eastpoint, Fla., employees are starting to clean up and take stock of the damage after devastating storm surge hit the area. Volunteers serve meals to residents of Apalachicola and Eastpoint, where hot food is hard to come by because of power outages. In some areas, the water was more than 10 feet higher than normal. Water came up over the coastal highway, U.S. 98, and caused significant damage to the businesses and homes along the highway. Scattered around the buildings were fryers, chairs, tables, and thousands and thousands of oyster shells. Outside Lynn's Quality Oysters in Eastpoint, four employees were stacking up waterlogged picnic tables, each painted a different pastel shade and all covered in mud. Lynn Martina was inside. She's still running the business her grandparents began decades ago. Her parents ran it after them. Back then, it was a tin building in this spot along Highway 98. A hurricane in 1985 wiped it off the beach completely, and Martina's parents built a sturdier structure with cinder blocks. "My dad told my mama, 'Ain't nothing going to take that building.' And it didn't," she said. "It didn't. My daddy's been passed away for three years now, and it's true." The storm surge didn't take out the building, but it did take out their entire back deck, made of concrete and wood, along with a back wall — and that allowed water into the interior. The water carried away almost everything that wasn't on a shelf or counter — supplies, food, even furniture — out the door, across the street, to the other side of the highway. She thought it would take a while to reopen, but she was committed. "We're survivors. We've done it before. It's just the price we pay for living where we live." The bridge from Eastpoint to Apalachicola is open now — boulders once lining the shore side of the highway to break waves were carried onto the road by the storm surge, but they've since been cleared. Apalachicola's small downtown was flooded by muddy water. The storm surge carried several boats, once moored in the harbor, into town or the marsh. But the damage in this town was relatively light compared to its neighbors, especially Mexico Beach up the coast to the west. As a result, most of the first responders to come through town — utilities, FEMA — were just passing through on their way to the harder-hit areas. Citizens in Apalachicola have been left without immediate aid. They described taking things into their own hands — clearing the roads, cleaning the mud out of buildings and rigging up generators to provide phone charging stations for neighbors. A retired day-care operator named Faye Johnson, who has lived in Apalachicola for 14 years, said it may be better off than other towns but they still need some help. "The people here, we are a community of individualists and people who survive on the edge of everything here," Johnson said. "We're 100 miles from anything. And that's why we're here. We like it. It's a lovely little town. But people have to [be able to] get here." For the people here who chose not to evacuate — and those who came back after the storm to care for their homes and businesses — things are still hard. Without aid, food and water are running short for some residents. Though many power lines in this area survived the storm intact, the electricity is out and could be for days. A hot meal and a cold drink are hard to come by. On the sidewalk outside a restaurant in downtown, a group of volunteers served chicken wings and burgers with scoops of mashed potatoes and macaroni and cheese. 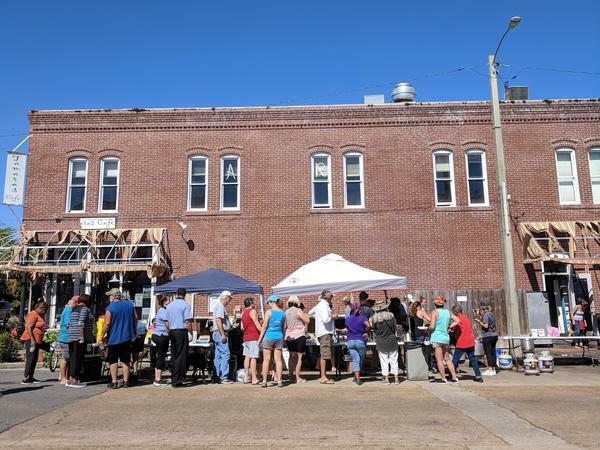 A long line of people, mostly residents from Apalachicola and Eastpoint, were waiting to be served. "We decided yesterday to not sit around and get depressed, but motivate and put a little sunshine in the community," said Lindsay Shepard, a teacher in Apalachicola who helped organize the food line. "So we asked for donations from residents to clean out their freezers, restaurants to clean out their freezers, so we can feed people. They all need a hot meal."